Stunning view of downtown Vancouver with the snow! 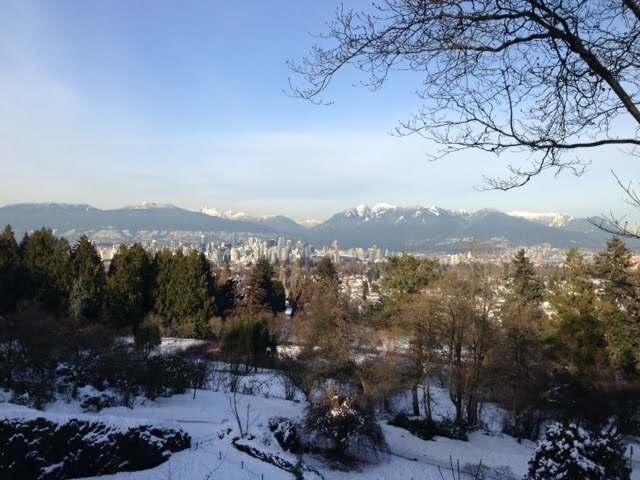 Queen Elizabeth Park is a nice place to visit particularly in the summer, but the views from this park up on the hill are dramatic with the snow still covering the city. 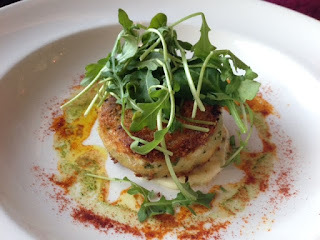 At lunch I took my mom to Seasons in the Park and had a delicious meal up there. Some of my friends asked if the restaurant is still a geriatric place to which I laughed. I did see many people take their parents there, but also a young couple on a date and some middle-aged couples treating themselves. Oh yes and a few tables with Chinese diners. The menu hasn't changed much since I was last there, but the service is a bit different; some of the kitchen staff come out and personally serve customers. Perhaps it's an opportunity to interact with people, but it's not a practice I have seen in any other restaurant I can think of. Nevertheless, my mom had a bowl of truffle mushroom soup (CAD$9) that smelled wonderfully rustic thanks to the added truffle oil and each spoonful was hearty. She also had the Dungeness crab cake (CAD$19), a very large one that was lightly pan-fried and very delicate, seasoned with paprika and citrus aioli. 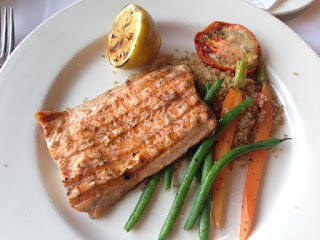 I had a cup Manhattan clam chowder (CAD$5) choc full of baby clams, followed by the Alderwood grilled Steelhead salmon (CAD$28), a fillet that was perfectly cooked, very tender, and even better with the juice from the grilled lemon. The fish came accompanied with quinoa, French beans and carrots. For dessert, we shared the sunburnt lemon pie (CAD$9.50), which is basically a slice of lemon tart that has burnt sugar on top, and decorated with mango and raspberry sauces. 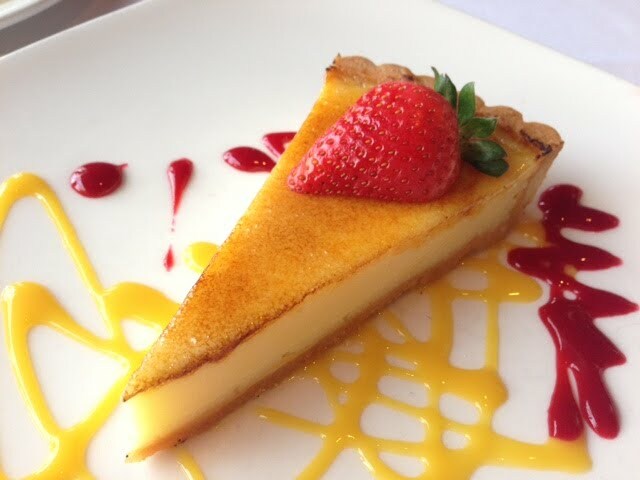 The crust was a bit thick, but the custard was divine. Afterwards we took in the dramatic view of the city from the terrace, that was a bit warmer thanks to the roaring fireplaces they had outside.